If you like this post, pin this image! Crochet enjoyed its first great golden age during the Victorian period, fuelled by the Queen’s interest and support of the craft. Since 1901, crochet has been on a rollercoaster with lows of being old fashioned and irrelevant and then highs of being trendy and catwalk cool. The reasons for this are hard to pin down but we need to look at crochet alongside what was happening to the world in general. At the start of the 20th century, the social order in Britain was already changing but World War 1 blew it to pieces. ‘Servants’ seemed not to know their place any more! As part of this social turmoil, crochet (but not knitting!) became controversial. The attitude that hooking lace was irrelevant and frivolous spread across Britain and other parts of Europe. In Denmark, newspaper letters were published in which Christine Hvass, wife of a prominent large landowner, objected to entries she had been asked to judge in a local crafts competition. She questioned why servant girls and women should think it was OK to crochet, embroider and decorate pretty items for themselves, instead of spending their time more usefully doing darning, mending and knitting clothes. This set off a heated argument, as you would expect. One response asked why anyone would object if a woman who has worked 16 hours that day chose to spend one hour making something nice for herself! The high-handed opinions of Mrs Hvass and others may not have stopped everyone crocheting but it did mean that image of crochet took a real battering after 1900. The combined impact of social change, the horrors of World War I, the depression of the 1930s and then the Second World War in the late 1940s pushed crochet firmly into the background for more than 50 years. Fast-forward to the late 1950s and the glimmers of a recovery. New fibre manufacturing processes, the rise in leisure time and an increase in wealth during the boom years of the next two decades proved an explosive combination. The granny square became popular and rapidly too centre stage in the fashion world with ponchos, trousers, skirts and even shorts filling women’s magazines in glorious technicolour. Time out for crochet – again! In the 1980s, crochet fell out of favour again. The homely colour of the granny square was being replaced by the cool sophistication of the economic boom, with steel, glass and shoulder pads taking over. Handmade became unfashionable as the shops exploded with manufactured textiles and products to feed our need for retail frenzy, and the granny square reverted to being interesting only to grannies! Keep calm and crochet on! Fast-forward again to the start of the 21st century. The excesses of the 1980s and 1990s have led to a worldwide economic downturn but also to a shift in the way we think. Everyone is much more aware of how what we do in our everyday lives can impact not only on our local surroundings, but also on the global environment. In the last 15 years I’ve been amazed to witness not only an upsurge in popularity for hand making generally, but an explosion of interest in crochet and knitting. The rise of the internet and social media has played a large part in this and its fantastic that people all over the world can become part of a global crochet community, sharing their latest makes, patterns and skills and techniques. If you had told my teenage self back in the 1980s that a picture of a granny square that I’d made in 2015 would get the thumbs up from 720 people on Instagram would I have believed it? 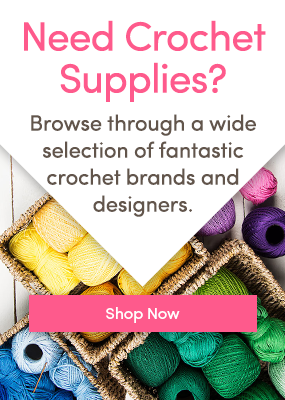 No – nor would I have foreseen that crochet clothes would be back on the catwalks or worn by red carpet celebrities, or on the racks of trendy High Street stores, or that we would have celebrity crochet bloggers with hundreds of thousands of fans! Kathryn is a professional technical writer with a passionate leisure interest in crafts, particularly crochet. Having got hooked in her teens, she rediscovered crochet again a few years ago and is really excited by the current upsurge of interest in this textile craft. Kathryn writes about using colour and texture to create stunning and visual crochet items. Her clear instructions and detailed tutorials are increasingly popular both on her own blog crafternoontreats.com. Great article , very interesting to read the history of this amazing craft. I was taught by my grandmother who was an expert crocheter who made elaborate creations including wedding dresses, lace, blankets,clothing,homewares, etc.The meditative aspect of crocheting is so relaxing and satisfying, a great way to relax and “unwind”.It is wonderful that the craft has been revived and rejuvenated, and lets hope it continues in popularity for decades to come.